Almighty God, kindle, we pray, in every heart the true love of peace, and guide with your wisdom those who take counsel for the nations of the earth, that in tranquillity your dominion may increase until the earth is filled with the knowledge of your love; through Jesus Christ our Lord, who lives and reigns with you, in the unity of the Holy Spirit, one God, now and for ever. Amen. It has been exactly one year since everything blew up in my life — one year since I started my leave-of-absence which led to my resignation from the church… and all that went with that… lost friendships, community, livelihood, purpose, church, etc etc etc. There is lots that I could reflect upon right now… a lot has changed for me. Some for the better, much not. In many ways I have grown a lot and am in a pretty good place. In other ways, I am still healing from all that happened. In some ways I am amazed how far I have come in a year; in others I am deeply saddened by how little relational reconciliation has taken place. But since today is Memorial Day, I am not going to do too much reflecting upon my own life. This is a day to reflect on those who have sacrificed greatly and paid greatly… there will be time to reflect more later. There is but one Christian ethic and but one Christian metric: LOVE. In other words, LOVE GOD and LOVE PEOPLE. All is else is commentary — or distraction. And those who proclaim any other Gospel are false teachers, not to be heeded. What is disturbing to me is how similar the rhetoric is from the Uganda pastors and Christian fundamentalists in this country… words can be dangerous. 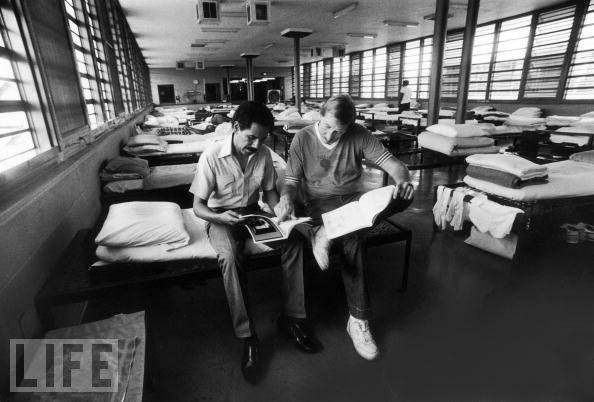 Ron Wikberg (right) with Wilbert Rideau at the Louisiana State Penitentiary at AngolaRON WIKBERG is the first prisoner I ever became friends with. He was a convicted murderer serving a life sentence in the most violent prison in America — the Louisiana State Penitentiary at Angola. Ron was convicted in 1969 in the killing of a grocery clerk in a holdup. He served 23 years in Angola, trained there as a paralegal and was released two years ago after undoing his life term through a legal loophole that he had found. Ron and I connected when I was a freshman in high school. I was doing some research on prison overcrowding for the debate team, and through a somewhat bizarre set of events got connected to Ron. We wrote regularly and spoke on the phone about once a year — always on Super Bowl Sunday, though I am not sure why. While it started as a research project, we actually developed a kind of friendship through our letters and writing. When Ron got out of prison (through a legal loop hole), I got to meet him in person. We spent New Year’s weekend together at his home in Maryland my senior year in high school. He died about 6 months after that of cancer. I wasn’t a Christian when I first started writing wrong, but became one during that time. In our letters we talked a lot about religion, spirituality, race, politics and life. He also wasn’t a believer when we started talking, but became one before his death. I learned a lot from Ron… about failure, redemption, grace, second chances — as well as things about writing and media and social policy. I remember that Ron was the first person I ever came out to, as a sophomore in high school. I figured that (a) I was never going to actually meet him (after all, he had a life sentence without parole), and (b) he was a murderer living with rapists and thieves and all-around bad people… so how judgmental could he be with me? I am not 100% sure exactly what that means nor that it is good advice to a 15 year old… but I experienced grace and acceptance through it. Anyway, in a strange way, Ron was a pretty influential guy in my life and I am thankful for that. I think he coached me in the centrality of grace, compassion and the idea that everyone has a story… and it is more than what you think it is. Those are lessons I carried into ministry and carry today. I also learned another good lesson from Ron: Good people do bad things and bad people do good things. Or in other words, WE ARE ALL A MIXED BAG. Ron taught me never to dismiss a person or allow their greatest failures to define them. I hold to that lesson today. And I like these folks. I’m not a martyr for hanging out with them. They are fun, have great stories, and are real people. They also have a lot of hurt and crap and brokenness in their lives. And sometimes being involved as a friend is really hard… and messy… and uncomfortable. And sometimes I want to bail to where it is safe and respectable and predictable. Sometimes it is easier to pontificate about people than to actually love people. Sometimes I wish I could get back to the protected space of a pastor’s office… say nice safe prayers… talk about the radical love of Jesus… but not have to do much about it. Sometimes I want to bail. And often that is what makes sense. To reasonable people. But I am learning that the guy I follow and surrender my life to is not always (or often) reasonable. He is passionate, wild, crazy, irresponsible, unpredictable and frankly, dangerous to be around. And so I don’t bail… because he doesn’t bail… on me or them.